Logitech's new wireless iPhone charger eliminates the heartbreaking overnight nudge. Having a wireless charging pad on my nightstand means never having to fish around in the dark for a Lightning cable plugged into the wall. However, there’s a tradeoff: Switching to wireless charging also means I’ve awakened to a nearly drained iPhone more often than ever before. Well, help is on the way for this admittedly first-world problem. The new Logitech Powered Wireless Charger eliminates the main drawback I’ve found when it comes to charging my iPhone wirelessly. A feature added to the iPhone lineup just last year, wireless charging is all about convenience. However, if you’ve used a wireless charger, you likely know about one of wireless charging’s downsides. To properly use most wireless chargers, you must position your smartphone fairly precisely to get the juice flowing. Dropping your phone down slightly off-center, or nudging it slightly in the middle of the night, can mean a nasty surprise when you wake up fully charged but your iPhone doesn’t. Got a cat that won’t stay off your nightstand? Forget about it. You’re waking up to a dead iPhone. Yes, slapping my iPhone X onto a wireless charging pad is always infinitely quicker than locating my Lightning cable and plugging it in as I fumble around in a pre-slumber haze. However, the thrill of a good night’s sleep can be ruined by an angry red iPhone battery icon the next morning. Logitech says it worked with Apple to create the new device, which is launching today. The goals? Bringing truly hassle-free wireless charging to iPhone X and iPhone 8/8 Plus, and making it so you can actually use your phone while it’s charging. The new Powered charger works in portrait and landscape modes. The Logitech Powered wireless charger definitely lives up to the challenge on the ease-of-use front. You just drop your iPhone in, and it starts charging immediately. It even works if you place your phone in upside down. What’s more, you can charge your iPhone in landscape mode as well. That means you can set your iPhone on the Logitech Powered charger and watch a widescreen YouTube video, for instance, while continuing to top off your battery. The Powered charger works with cases up to 3mm thick, according to Logitech, and delivers 7.5-watt charging (the fastest currently available for iPhones). I got between 10 percent and 15 percent charge every half hour on my iPhone X.
Looks-wise, this is not the most elegant design I’ve ever seen. The Logitech Powered charger comes in white only. Its smooth, rubberized surface proves pleasing to the touch (but will likely show dirt fairly quickly). From the front, the U-shaped bottom of the charger exhibits chunky lines. The vertical charging plate rises out of the base, holding your iPhone a convenient angle for viewing. It’s made of matching white material (with a subtle “Logi” logo debossed in the middle). At first glance, there’s something prototype-y about the Powered charger’s look. It almost seems like the charging plate could be removed from the base to lie flat like any other charging mat. Still, the simple design ultimately proves quite stable. Four tiny feet on the bottom raise the charger ever-so-slightly off the surface of your nightstand or desk. A pair of tiny lips on the front of the base’s U hold a horizontal iPhone in place securely. And a slender slot at the bottom of the U gives a vertical iPhone’s speakers room to squeeze out sound. A substantial 4-foot-plus cable — also white, and permanently attached to the vertical charging plate — plugs into a blocky power adapter with a proprietary Logitech connector. It’s nice that the charger comes with everything you need to use it out of the box. However, if you lose the rather large wall wart that comes with the Powered charger, you’ll be crying all the way to the ATM. You must buy a replacement rather than simply swapping in a standard USB wall charger. 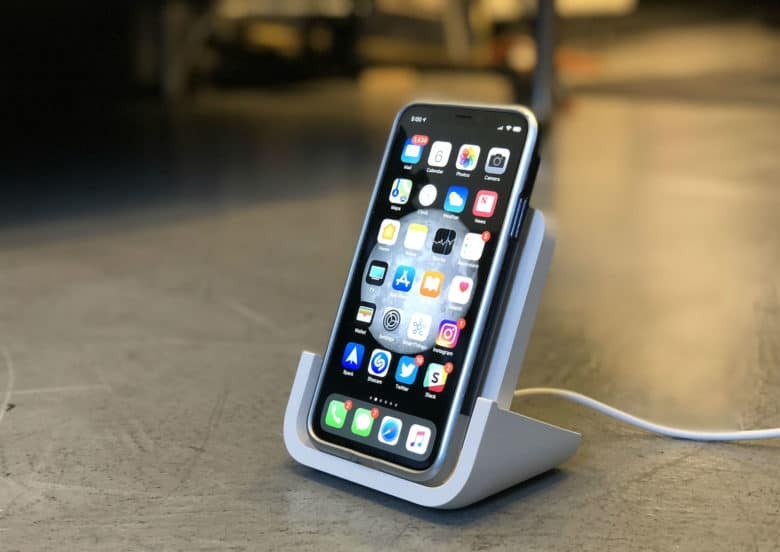 A couple of other docks featured on our list of best wireless charging pads for iPhone also prop up your device while charging. Several cost less than the Logitech Powered charger’s $69.99 list price (although those typically require a separate charger). If you’re looking for a bargain, the Powered charger isn’t your best bet. You also might want to wait for Apple to finally release its troubled, long-overdue AirPower charging mat. However, few wireless iPhone chargers work in both portrait and landscape modes. And few companies boast Logitech’s well-deserved reputation for building solid Apple accessories. If utmost ease is what you want from wireless charging — and you’d like to actually use your phone while it’s slurping up juice — the Logitech Powered charger is a solid (if innocuous) choice. The Logitech Powered Wireless Charging Stand, announced today, should be available this month at a suggested retail price of $69.99. Logitech provided Cult of Mac with a review unit for this article. See our reviews policy, and check out more stuff we recommend.